The Jazzomat Research Project takes up the challenge of jazz research in the age of digitalisation. It intends to open up a new field of analytical exploration by providing computational tools as well as a comprehensive corpus of improvisations with MeloSpyGUI and the Weimar Jazz Database. This volume presents the main concepts and approaches of the ongoing project including several case studies that demonstrate how these approaches can be included in jazz analysis in various ways. Zitation · Pfleiderer, Martin/Frieler, Klaus/Abeßer, Jakob/Zaddach, Wolf-Georg/Burkhart, Benjamin (Eds): Inside the Jazzomat. 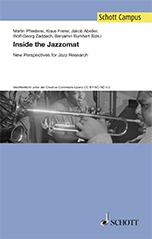 New Perspectives for Jazz Research, Mainz 2017 [Schott Campus, urn:nbn:de:101:1-201711151872].